The definitive guide to the world’s top ten best office chairs. The Think chair is Steelcase’s mid-range, mid-priced chair, but don’t imagine that that makes it middle of the road. First of all it looks beautiful, it has very clean lines and a minimal look, mainly thanks to the lack of bulky tension controls under the chair. This is because the back tension borrows from a Humanscale innovation (see number 6) and actually leverages off the weight of the user. This has a number of benefits: The chair components are reduced, so the chair is less expensive, has less impact on the environment and also contributes clean design lines underneath the chair. 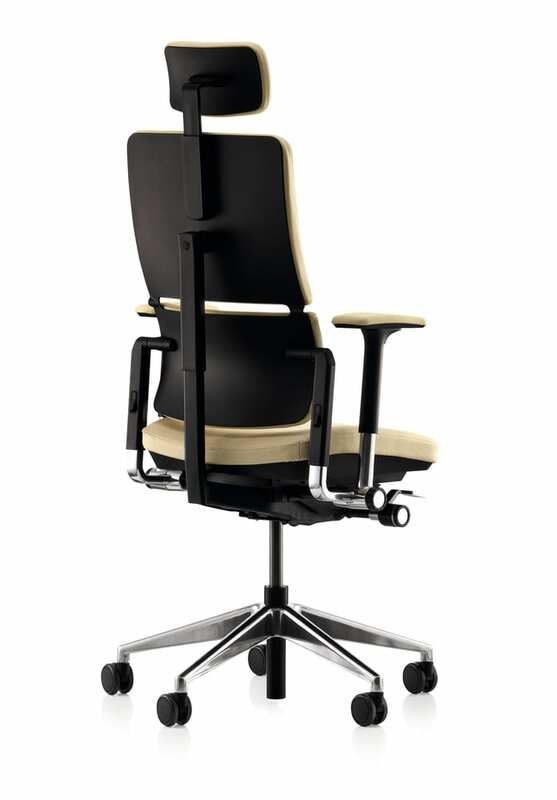 An added bonus is that without touching the adjustments anyone can jump into this chair and feel almost instantly comfortable – on some of the more sophisticated chairs the controls never actually get adjusted properly for the user, this chair however automatically adjusts to your weight and is therefore ready to go making it perfect for hot-desking environments, or where simplicity of use is preferred. 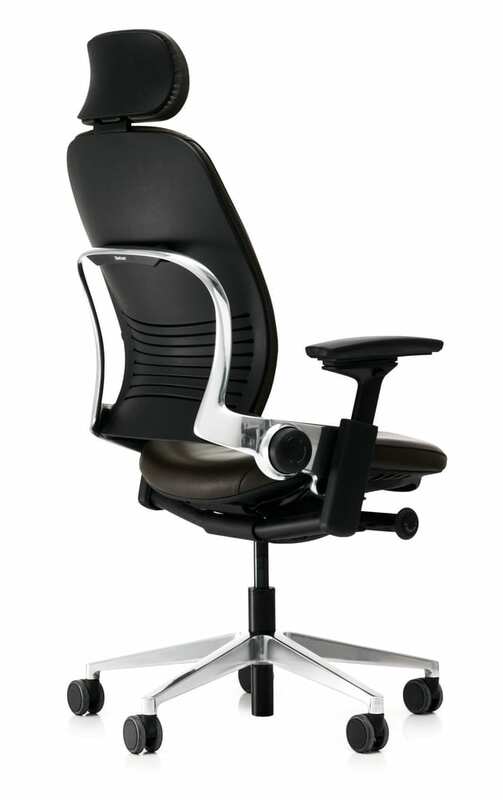 The back mechanism, although not as sophisticated as big brother ergonomically, still makes use of Steelcase knowledge and has individual flexors to allow the back to move freely. The tension mechanism also has a pleasant lifting motion when leaning back. Arms are also 3D height and width adjustable. 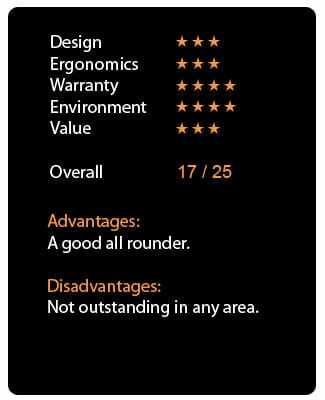 All round for value, looks, ergonomics and quality – Think is our winner. Gold Medal in the top ten best office chairs in the world. Mirra came along a little later after the iconic Aeron (Number 4 in our list), but shares a lot of it’s aesthetic qualities. 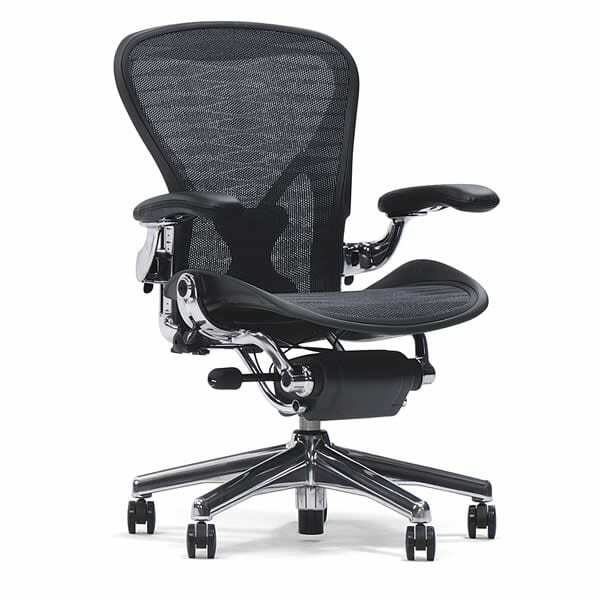 It’s certainly a good-looking chair, and could be mistaken for part of the Aeron family to the untrained eye. The back mechanism is effectively solid plastic, but works surprisingly well with a high user satisfaction. The perception of the frame and the holed plastic back is of a very high performance ergonomic chair, when in fact this is a mid-range chair from Herman Miller, with a mid-range price point. Although there are better chairs ergonomically from the same stable, it overtakes its siblings by being also well made and beautifully designed, but better value for money and kinder to the environment, taking top spot overall out of all of the Herman Miller chairs and second overall. 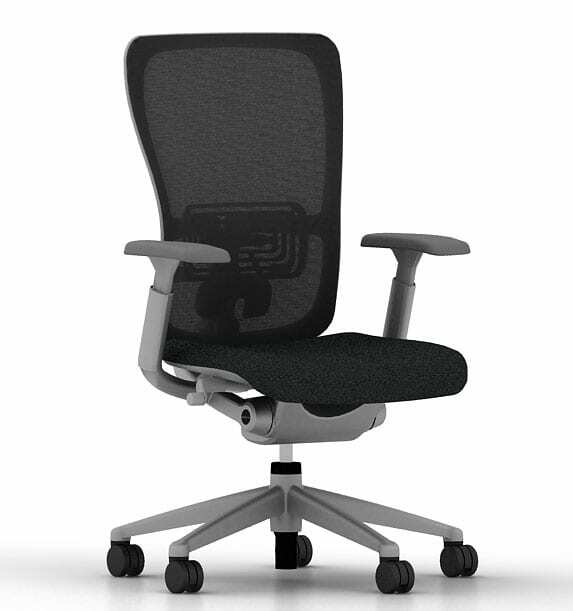 The Steelcase Leap chair was Steelcase’s answer to the Aeron (number 4 on our list). 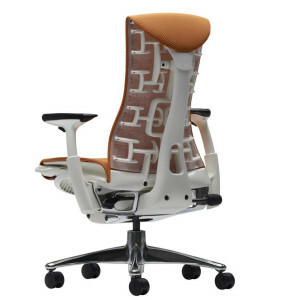 Steelcase took their time and did a lot of research before launching this chair quite a few years after Aeron, the chair itself has 52 patents. 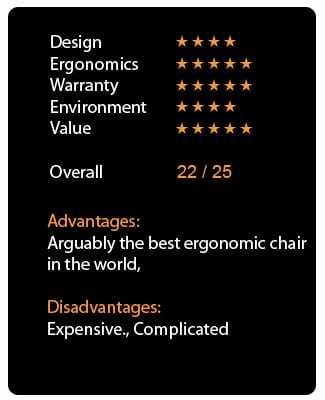 This chair is pretty much recognised as the best ergonomic chair in the world. The reason it doesn’t win overall for us, is because it is also the most expensive chair in the Steelcase range, and its very sophisticated complexity pushes it behind its little brother Think for us, which has less impact on the environment, is simpler to use, arguably more attractive and less expensive, whilst still being very comfortable. 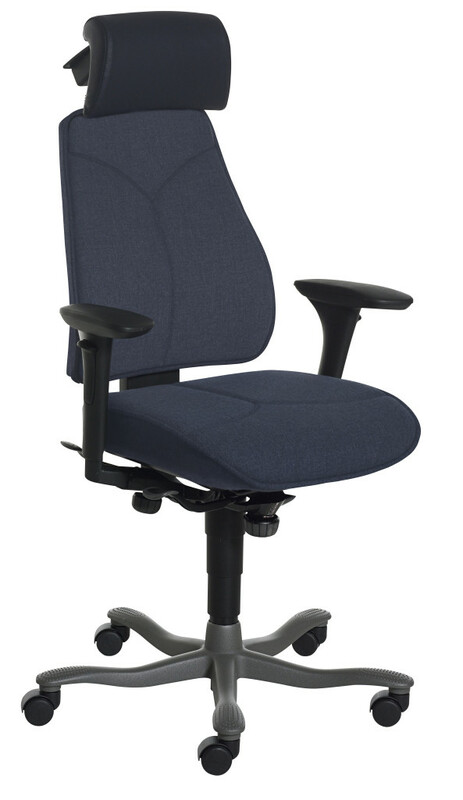 However, don’t let us put you off if you’re looking for the best ergonomic chair money can buy. The key to this design is the back mechanism and the recline. Both the Steelcase Leap and its European sibling the Steelcase Please chair have a very important feature that allows the lumbar to move independently from the back of the chair, this allows the spine to flex like a bellows freely, meaning the back remains lubricated and in motion, rather then held in place when pain and tension can occur. 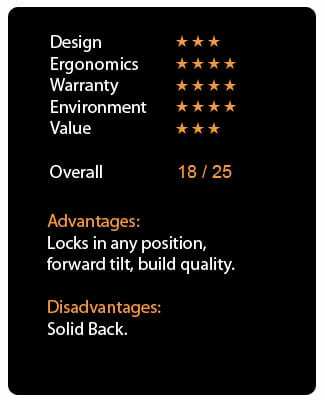 Another feature is that when the back reclines, the seat slides forward – no doubt answering a common complaint that the Aeron chair feels like a “rocking chair” (rocking down and away from the table). This means when Leap reclines, your hands do not pull away from the desk or keyboard, but remain in the same position as you move. 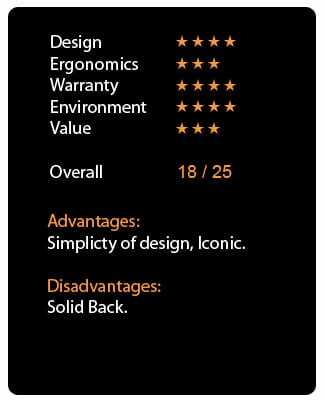 Given the attention to detail Steelcase put into this response to Aeron, it’s not surprising it is now considered the better chair. 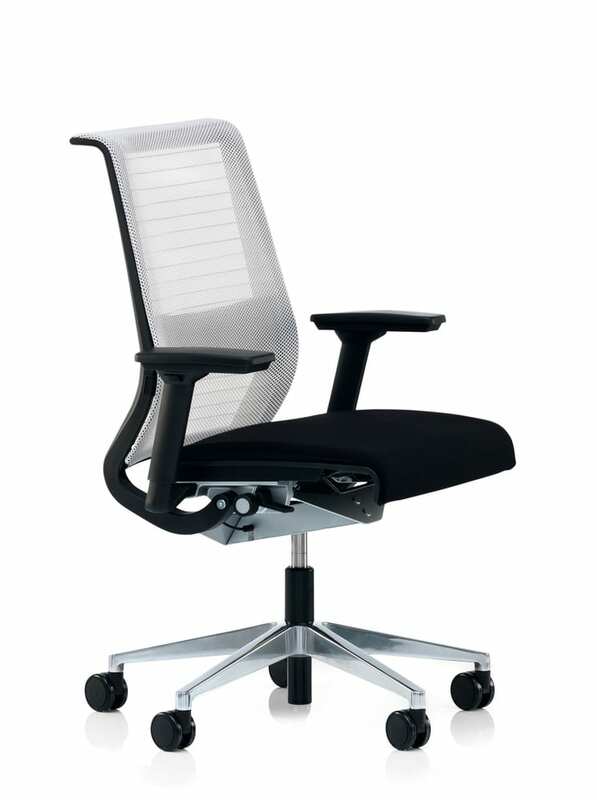 Internally at Steelcase it is interesting to note that for some, the European designed Please chair, which is not available in the US (number 5 in our world list) –is considered by some to have the better back mechanism. 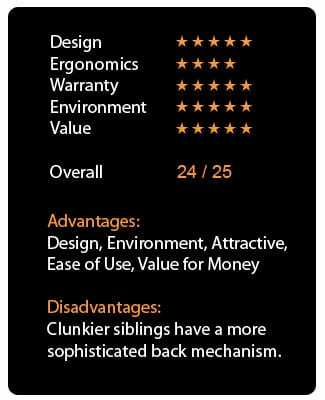 Note that if this list was based on ergonomic back mechanisms alone Leap and Please would occupy first and second spots, so check them both out if this is high on your list of properties. See here our report on Leap increasing productivity. 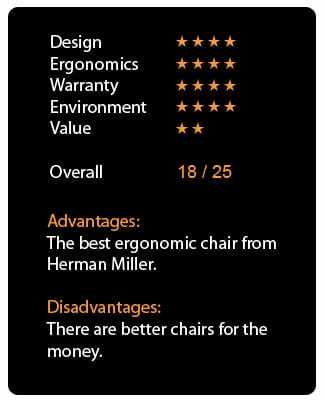 Although starting to show its age against newer competitors, the Aeron chair is still an icon of excellent chair design. 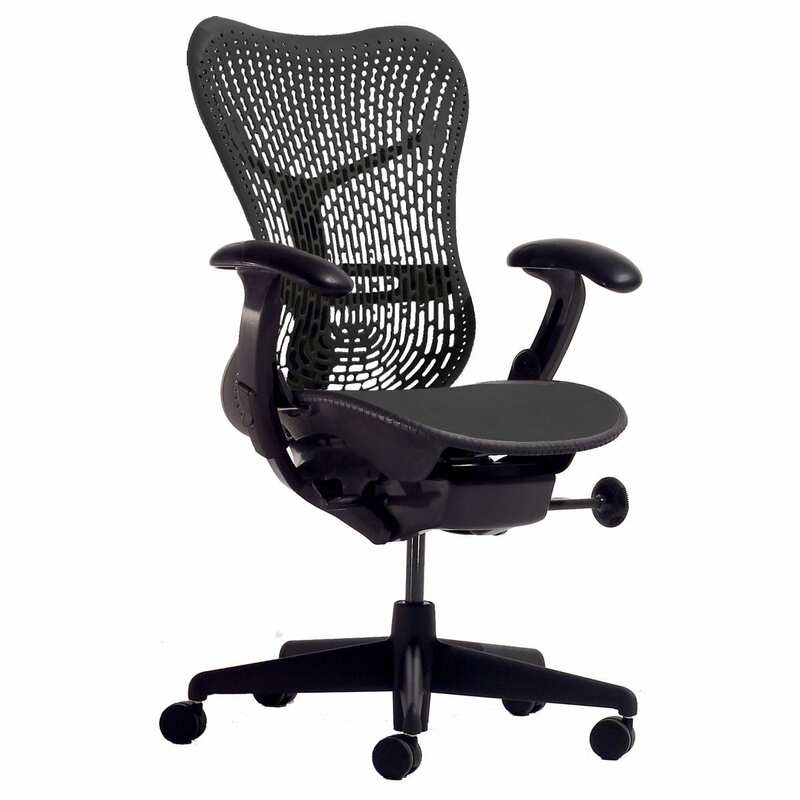 Aeron virtually defined this whole sector when it was launched and it took years for the competition to catch up. The whole modern movement favouring a mesh back on modern chairs, compared with traditional upholstery, is largely down to the trampoline design of this chair. Undoubtedly a comfortable chair, any employee presented this chair will know they are a valued member of the team! 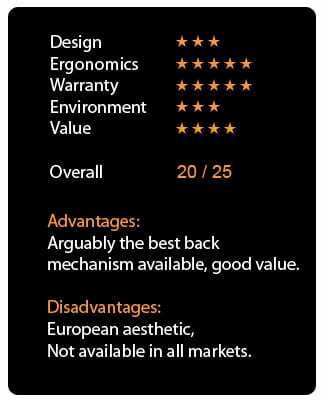 Iconic design, great build quality are all certainly compelling, however its newer and cheaper stable mate have many of these qualities in a better value package, which is why we chose Mirra over Aeron as the best Herman Miller chair. Although the Embody chair is better than Aeron ergonomically (number 8 in our list), Embody can’t match Aeron for its pure iconic design status. Aeron is still an impressive candidate and worthy shortlist for Top Ten. Perhaps a surprise entrant for some not familiar with this less famous chair (it isn’t sold in the US by Steelcase because this European designed chair overlaps with Leap), but this chair has possibly the best back mechanism of any chair on the market. Like Leap, this chair also has an independently moving and adjustable lumbar, except it is even more flexible than the Leap back. For many this chair is considered better ergonomically than Leap for this very reason, so if you’re outside of the US it’s worth trying both chairs out. It’s also slightly cheaper than Leap. Unlike Leap, the back can also pivot from side to side around the back support column, allowing even more free movement of the spine. 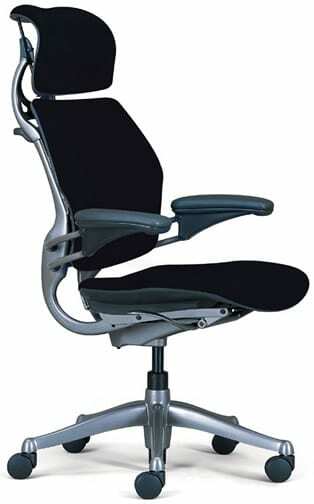 In this regard, it stands comparison with the best ergonomic chair from Herman Miller, Embody. In our view the more flexible back mechanism in the lumbar of this chair makes it better ergonomically than Herman Miller’s Embody chair, which is also far more expensive – hence our decision to place this ahead at fifth spot. Another defining iconic chair. This is the original Humanscale chair that gave the established manufacturers a surprise from nowhere and worthy of a top ten finish. At a time when chairs were becoming more and more complicated, this chair did away with all the knobs and levers to create a remarkably comfortable and ergonomic chair. Like our winner, Think, it was the original chair that leveraged the weight of the occupant to create a balanced free float “pre-adjusted” mechanism. The result is an uncannily “instantly” comfortable chair, that looks clean and has minimal environmental impact. Its rigid back mechanism lets it down in more illustrious company, but a worthy top ten chair. Its newer baby brother Liberty is perhaps a worthy alternative consideration. Another European chair not so well known in the states, this is the top ergonomic chair from Kinnarps the Swedish manufacturer, and one of the largest manufacturers in Europe. A very solidly made chair both the 6 series and 8 series chair have slightly differing mechanisms depending on user preference. The 6 series has a seat and back that move completely independently of each other, creating a free floating feel to the chair. If that is too much freedom of movement for you the 8 series moves in a more predictable way, with the back and seat synchronised. One feature that really sets these chairs apart: Remember those “knee chairs” where you sit inclined forward with your knees underneath? Keeping your back perfectly straight? Well both of these chairs seats actually tip forward and lock in any position, allowing you to sit as if on a medicine ball, very good for the back. Unfortunately the back mechanism itself is inflexible, therefore it doesn’t quite cut it in comparison with some others, but an excellent chair all round nonetheless. The best ergonomic chair from Herman Miller, it’s also eye wateringly expensive. Although beautifully built, overall we couldn’t help but be disappointed by Embody. Designed by Bill Stumpf, the original designer of the Aeron, we expected the follow up to be nothing short of astonishing. 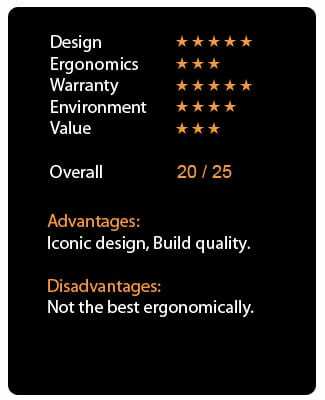 It’s good, and certainly better ergonomically than Aeron, but it does have a few failings that drop it down the list for us overall. First of all the design is something of an acquired taste – of course it would have to go some to match Aeron in this department – but the design never really manages to shake of a slightly gimmicky look. It would look great in a funky media firm, especially in the bright orange of the promotional shots, but the exposed skeleton effect back looks more for show than go. We can’t imagine this chair dominating the floors of the investment banks in quite the same way as Aeron or Leap now do. The back mechanism itself, although more flexible than any other Herman Miller chair, only partly answers the questions put to it by Steelcase Leap and Please without ever improving on either of them – and at a much higher price tag. 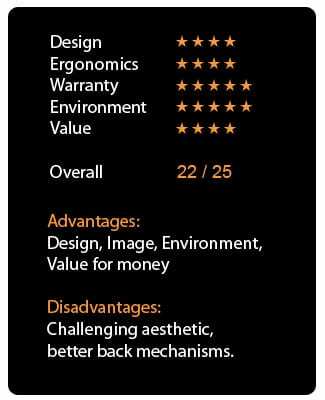 So overall a good chair (we would place it third overall for ergonomics, behind Steelcase Please and Leap), but given its acquired aesthetics and eye watering price, 8th place only overall. It’s great to see a chair here from Knoll, another iconic US manufacturer based out of Grand Rapids. In terms of the architects and designers, Knoll is perhaps second only to Vitra for cool with a stable of design classics to its name. Unfortunately it can never quite reach the heights of Herman Miller or Steelcase on the world stage, forming more of a cool niche alongside the likes of Vitra. 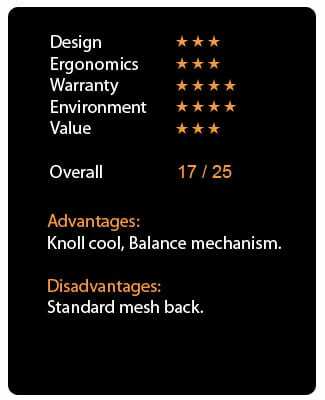 Life was Knolls great post Aeron and Freedom chair and incorporates a lot of the qualities expected in modern chairs, but in a very attractive and high quality jacket. Like Think and Freedom, the chair leverages off the weight of the user automatically adjusting to the user. The back mechanism is a fairly simple mesh back. The overall aesthetic is very attractive, although it doesn’t really stand out compared with many mesh back chairs these days, save for its auto balance mechanism. The look, auto balance mechanism and Knoll reputation put this chair into the top ten ahead of a few similar chairs. A very good generalist chair without being outstanding in any given area. 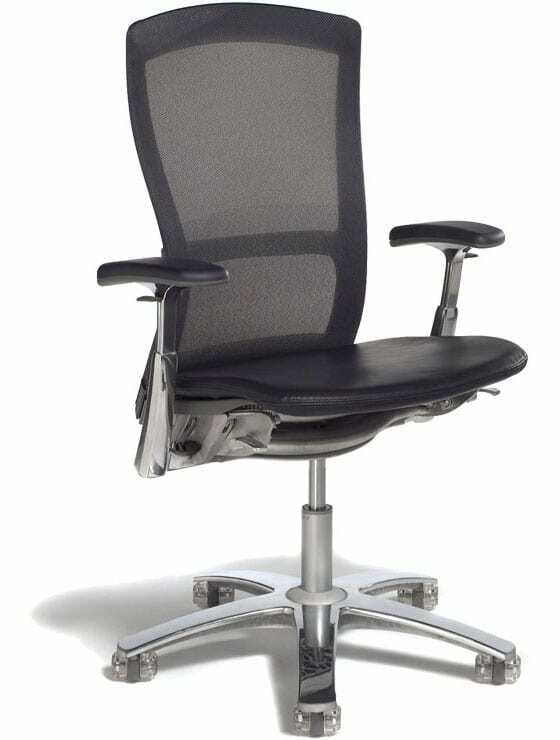 Available with a mesh back and height adjustable lumbar, it also has all the other adjustments you would expect on a quality chair without anything ground breaking, such as seat depth adjustment, 3D arms, tension and tilt etc… It is however very well made, looks attractive and manages to slip into the top 10 as the best of the rest from the remaining top manufacturers. This chair goes under different names in different markets and is marketed by different manufacturers. Steelcase are close to bringing out a new high-end chair. Considering three of their chairs occupy the top ten slots, this could be a big deal. Watch this space to see if anything changes in our top ten, but early indication suggests this could be a cracking chair. First of all it looks sleek, simple and attractive. It has clearly got a flexible back mechanism like Leap and Please, but with a more adjustable arm to facilitate different positions brought about by modern working positions – especially from the use of tablets, phones etc… the likelihood is that the recline is more aligned with Think, so that the chair automatically adjust to the user without complicated interaction with the controls. If the price point is reasonable, you will almost certainly be looking at a new top ten chair, possibly pushing for the top spot…watch this space!